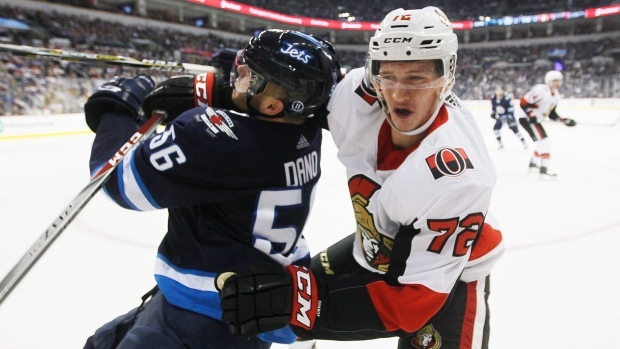 The Ottawa Senators' blue line will be without the services of Thomas Chabot and Christian Jaros for the next three and four weeks, respectively, head coach Guy Boucher revealed on Saturday, while forward Magnus Pajaarvi is day-to-day with an upper-body injury. Chabot is sidelined with what the team is calling an upper-body injury, while Jaros has a broken finger. The 21-year-old Chabot picked up his injury during the second period of Friday night's 6-3 loss to the New York Islanders. He took a hit from Islanders forward Matt Martin and left the contest without returning. The 18th overall selection in the 2015 NHL Entry Draft, Chabot has shouldered the offensive load for the Senators' rearguards following the trade of Erik Karlsson in the summer. Chabot has 10 goals and 28 assists in 38 games this season. His 38 points are second among defencemen this season, trailing only Morgan Rielly of the Toronto Maple Leafs (44). Jaros, 22, likely picked up his injury during a fight with Ross Johnston of the Islanders on Friday night. In 28 games this season, Jaros has a goal and four assists. Paajarvi, 27, has appeared in 38 contests for the Sens this season, recording three goals and an assist. The Sens, losers of three straight, host the Washington Capitals on Saturday night. Marcus Hogberg gets the call in net for his first career NHL start.